I'm pretty sure that the field is cochineal, but you wouldn't know it, to judge from the photo. It is a purple, but not as rich as that seen in the Kirshehir's with which I am familiar (and from photo's at that). The field is the same near magenta shade seen in the yellow cross panels. When the light is reflected at the right angle (as in when using flash to photograph) it is this red color. Are we sure that it's even from Kirshehir proper? The proportions and size of the mihrab in relation to the rest of the composition looks (to my inexperienced eye) like a Mucur, and the flowers in the blue border remind more of a simplified Mucur floral border than a simplified Kirshehir floral border. But then the narrow borders say Kirshehir. What of this "S" cartouche border? Who can say? Sometimes small details make a rug interesting. Besides the asymmetrical mihrab, I especially like the corner resolution in this rug. They have that look of spontaneity. I read the composition as being a minaret, seen in perspective from the ground and against a backdrop of sky and cloud, upon which the remainder of the composition is superimposed. There is another lazy line, nearly the same length and in the same position as that of the blue, at the base of the mihrab. My guess would be that the weaver tired of stretching across the full length of the rug during the entire weaving process. If the line were the consequence of being woven by two people, I would think there would be more lazy lines. 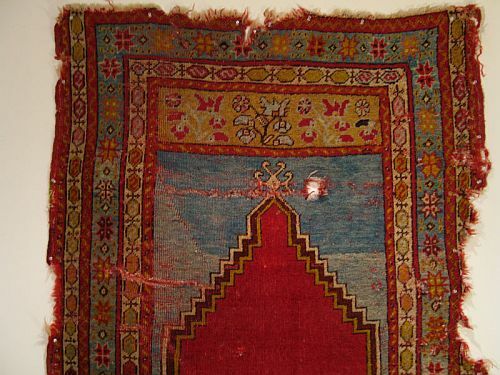 It's interesting to note that this rug was woven from the top down, hence the pile faces upward when hung on the wall with the apex of the mihrab facing up. It seems pretty obvious to conclude that the woven area begins to taper as the distance from the work area to the weaver increases. 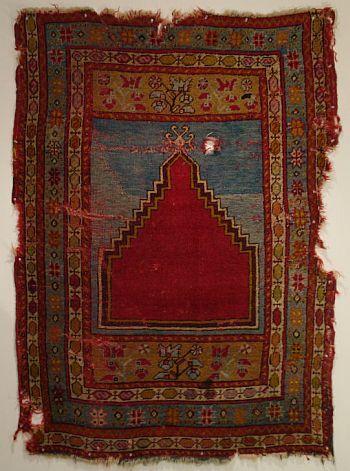 This seems to be a late 19th century Kirshehir prayer rug in the "Mucur" style with a cochineal red, instead of the synthetic red found in these same rugs of a more recent vintage. From an artistic standpoint this rug is of good quality. 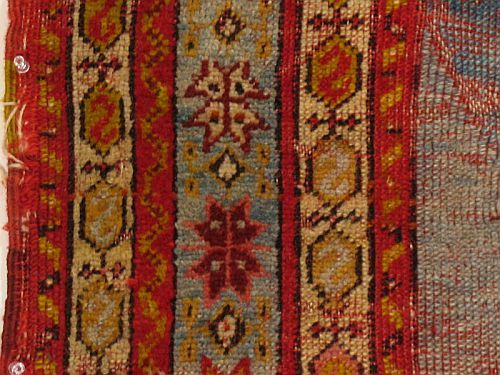 The colors are bright and 'happy', as it is my understanding this type of Turkish rug should be. The colors seem of tradition and are quite vivid. 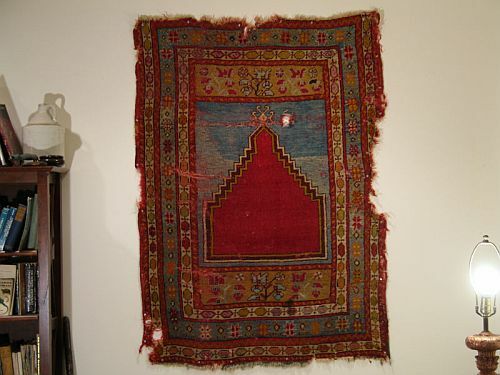 It has a strong purple, which is good to see in a Turkish rug of this type. I believe the white ground border stripes are an excellent compliment to the design.The prominence of yellow,especially, livens and highlights. 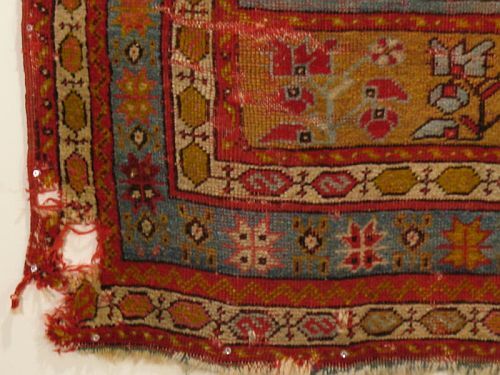 It has been suggested that the sulphonic blue dye could date this rug to as early as 1865, but it is my understanding that these 'Mudjur' style Kirshehir rugs were produced relatively late in the 19th century. The blue is an early synthetic, but what of the other colors? They conform to the discription in Eiland's "Complete guide", and while pretty intense, they don't have the qualities seen in synthetics. I suspect these other colors to be natural. The color representation in the following photos are fairly good, but the camera has still rendered them a little harder than they are. Intentional or not, I like the abrupt change in color, really does add a new dimension to the weaving, and affects my interpretation of the design. If the blue were monotone, the design might look more like what it probably was, an archway with a lamp at it's apex, instead of a minaret against the sky. Also, the rug's got an old patch and reeked of mothball, so it seems that someone in the past had thought this rug worthy of preservation.